At the risk of making a rash generalization, I assert that most music is intended to be listened to awake. This goes double for music played in nightclubs and concert halls. But there are pieces that not only accommodate but encourage unconsciousness, and Max Richter’s Sleep is just such a work. Released last year, it’s an eight-hour opus made to assist the listener in having a better night’s rest. It incorporates specific low frequencies and recurring movements created with the consultation of a neuroscientist to induce a state of deep “slow wave” sleep. But beyond its purely functional elements, Richter also designed Sleep to provide a kind of pause for the listener from the swarm of miscellaneous data that now makes up life in today’s hyperconnected and socially networked world. Sleep promises sleep in a conventional sense, but it also provides a moment of rest from everyday information bombardment. Yet this recess can only happen if the entire piece is listened to on its own terms. It’s an experiential work in the vein of John Cage in that you can listen to 4’33” any time you want, but it’s not the same as going through it with an audience. Likewise, Sleep demands a controlled environment to be truly effective. 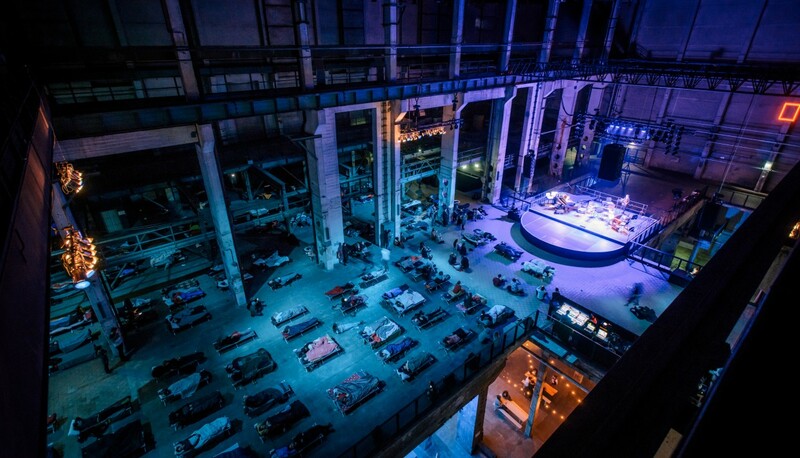 And that controlled environment was provided last Tuesday, when Richter performed the whole piece two nights in a row as a part of the public premiere during the MaerzMuzik Festival (which we reviewed last year) at the massive Kraftwerk complex in Berlin, which also hosts the annual Atonal Festival. Kraftwerk’s suspended upper level was furnished for the event with a grid of individual beds. Guests were asked to bring pillows, sleeping bags and other items (toothbrushes, a teddy bear perhaps) to make the experience more comfortable. The emphasis on comfort makes sense when you consider that the concert hall itself is housed in a converted wing of a still functioning power station. Its concrete and industrial iron interior cut a hard contrast to the mess of bedding spread out across the floor, and the juxtaposition of the two made it seem like the interior of some brutalist spacecraft. At the far end of the room, the stage played the role of a cockpit. It’s instruments were illuminated by the glow of a warm purple light, with a clock placed on Richter’s piano that displayed the exact time down to the second. Moments before starting, Richter appeared on stage and solidified this travel analogy by wishing the audience, “a nice journey through the night.” And then the music began. The soothing, pulsing chords of “Dream 1 (Before the Wind Blows it All Away)” induced an immediate sedative effect. Each note contributed to a growing feeling reminiscent of the imminent unconsciousness that arrives before dreams takeover. A sizable crowd gathered around the stage. I even saw one girl trying to dance, which was weird because Sleep is basically the polar-opposite of a clubbing experience or dance-oriented event. Though Kraftwerk can make a swell techno club—I heard many people swapping stories of sleeping in similar venues—on this particular night it was a space of inverted club expectations. Eventually everyone would be asleep together but locked away in their own solitary fantasies. Despite the fact that dreams are not shared, there’s a camaraderie to dozing in a public place with a large, single-minded group of people. This feeling is cultish, though similar to long trips by plane or train, which are the only other circumstances I can think of that involve sleeping in public. Despite what you might think, sleeping to Sleep is a memorable experience. Throughout the whole performance, I found myself phasing between vividly surreal dreams and being aware of different motifs in the music. It was like climbing a ladder from waking consciousness to absolute surreality. This continued throughout the night to the point that the line between the two seemed to blur, an effect that was emphasized by the novelty of occasionally waking up on Kraftwerk’s floor with Richter and his crew still playing on stage. During a waking moment in the middle of the morning, I sat up in my bed and watched as the music played to a room that was almost entirely fast asleep. I later woke up to people milling around the hall with coffee cups in hand. We’d just nearly arrived at our destination. The music had eased into a slow pulse. I laid there and continued to listen in bed. The voices from earlier returned and signaled the beginning of the end. When 8:00 rolled around, a large group had gathered near the stage. The digital timer reached its zero point, and then the music stopped. A surprising silence filled the hall, and then applause. Looking around you could see people ripping off their sleeping masks to try and see what was going on. The performed piece has a built-in alarm clock. Afterwards, a camera crew from Arte asked me some questions about how I felt after the piece. I didn’t say it at the time, but I didn’t feel very well rested. Instead, I later realized that though I felt refreshed, I still had a kind of jet lag. The whole experience was like taking a transatlantic flight that dropped you off right where you started. But was it worth it? Sure, and it was cheaper than a transatlantic flight, too.